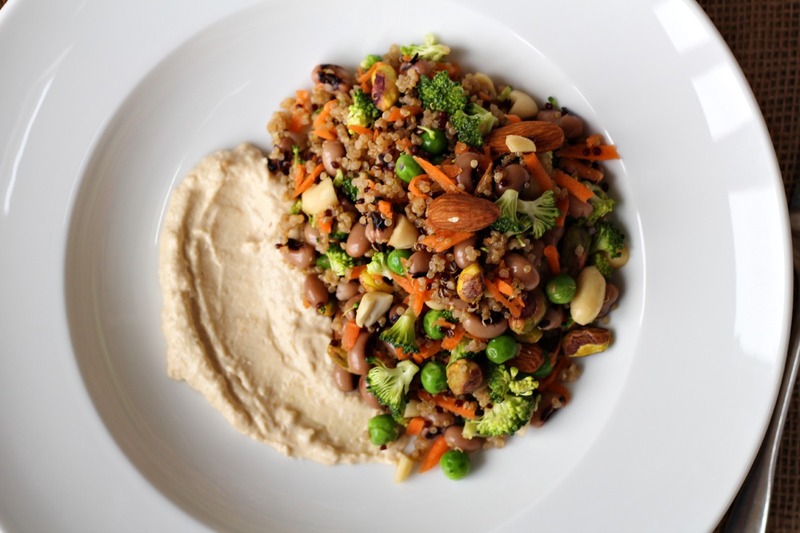 This nutty superfood salad recipe is a ‘dupe’ of one of my favourite Marks and Spencer lunches. I don’t think I’ve ever loved a salad as much. 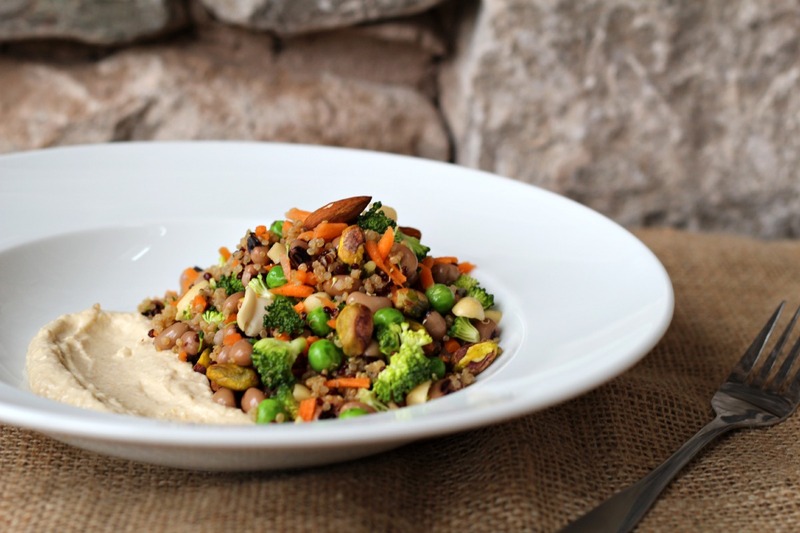 It’s knocked the wild rice & lentil off the top spot. To call this a hearty salad sounds rather oxymoronic, but it is hearty, and it is a salad, so I’m going to persist in calling it that. I’ll forgive you if you’ve never tried nuts in a salad before, but they’re a game changer. The protein, healthy fats and texture they bring turns what could be a limp salad in to something much bolder and better for you. Raw broccoli is a new one for me too, but it really works in this. Before I share the recipe, let’s have a moment of ‘real life as a blogger’ from the day I took these photos. It was an overcast day. I hunted the house for the best light and decided to set up on top of a big wooden chest by the front door. The exposed stone wall adds a bit of interest to a photo and for lazy points, I can sit on the floor whilst I get the perfect shot. So there I am, sat on the floor in the huge entry of my Parent’s house. The entire wall is floor to ceiling glass. I’d picked out a white pasta bowl that I laid on top of some hessian for a bit of texture (actually a 10p B&Q sandbag). Camera slung around my neck, spatula in hand, tub of houmous in the other. Something in the corner of my eye caught my attention. It was the postman. He looked completely bewildered. He didn’t knock, he just dropped the parcel on the floor outside and walked away. Turning back I could read the look on his face. “Was that girl eating her lunch off a wooden chest by the front door, with a sand bag as a coaster?” Yep, Mr Postman, that is what I was doing. The Marks & Spencer version of this recipe comes with a heap of houmous buried under the salad. I pinch a little with each forkful, Matt mixes it right through. 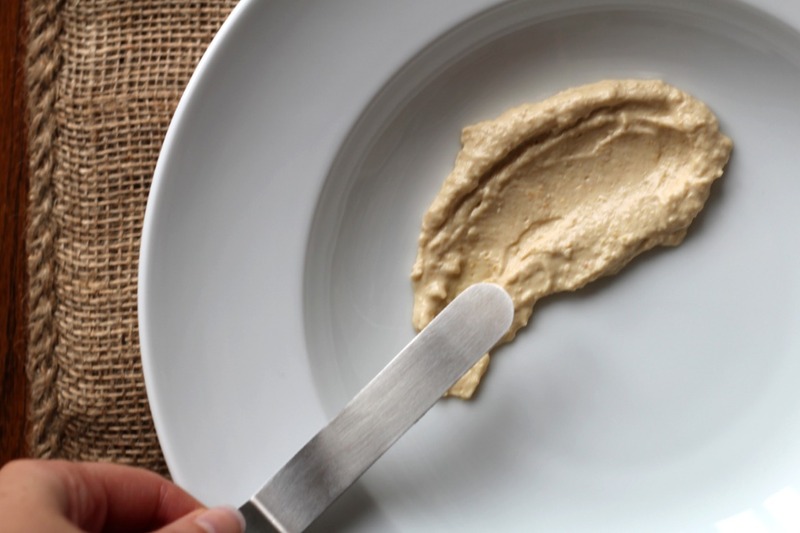 However you eat yours, the houmous is an essential flavour in this mix up so don’t skip it. Smoosh around one tablespoon per person on to your plate or in to your lunch box. Combine the other salad ingredients, chopping the broccoli in to the tiniest florets. Heap on to the plate. Mix the dressing ingredients together and drizzle over each portion or alternatively, toss through the entire lot in a large bowl. There are quite a lot of ingredients in this but feel free to play around with the components of the salad. 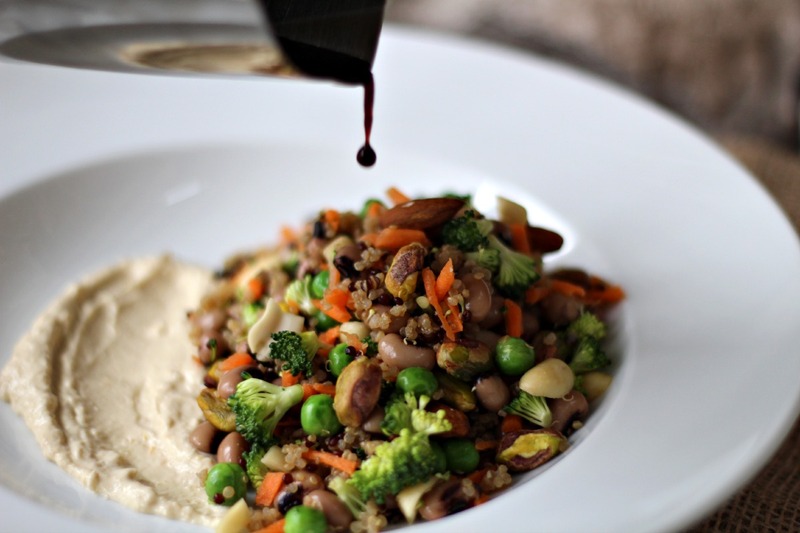 Lighten the prep by using the ready cooked quinoa, stocked by most supermarkets now. Use frozen peas if it saves you hunting down a fresh pack out of season. M&S have green beans in their version, try bulgar instead of quinoa, use different nuts, add some chilli to the dressing. And if you do make it, please let me know how you get on. thank you, thank you, thank you.. I love this salad so much and was struggling to replicate at home until now..yum! 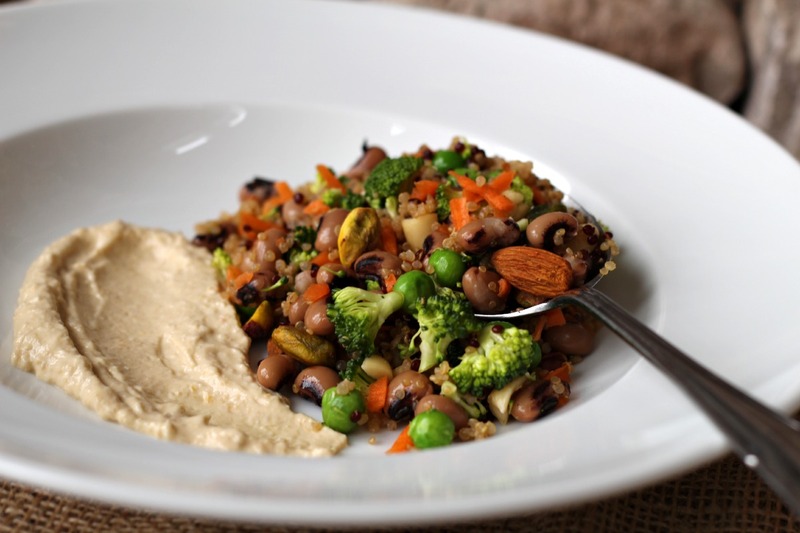 My mum and I have been eating this salad for months after every trip to the hospital we would sit in the car and enjoy every mouthful….. so glad I found the complete recipe because I want to make it at home. I found this salad in M&S yesterday and love it. Do you think they whiz the cannellini beans with the tahini as there was lots of white paste in the box ? I love this salad, and was perturbed when my M&S stopped selling them! Now they offer a £4 Nutty Salad, but the amount of the nutty salad is tiny and they have put it with lots of rocket/leaves! Not tried your version yet, but have tried the M&S £2 version (quinoa & edamame soybean), to which I add chunks of cheddar cheese, apple, and some raisins, which seems to me to work well. I also LOVE this salad. I just discovered it this week and googled it to see if I could find the ingredients. Delighted to have found the recipe. Will make this weekend. I was wondering what you think about making a huge batch and storing it? Could it be frozen, kept in the fridge for a while? Thanks! Did you try this? 🙂 Would love to know if it works as would be great for packed lunches. Also thank you so much for posting this recipe! I made this today! I love the M&S version, I have it every time I get a lunch from their to-go food section. This recipe was a brilliant and super helpful starting point, I would just say that there wasn’t enough dressing for my taste buds so I’m going to make more of it next time. Thanks also for the reminder that M&S include green beans, I had forgotten. So glad this dupe recipe exists!! Thanks.